Picture the person at who at a poetry workshop will tirelessly explain the profundities of their poem, while marvelling at your lack of comprehension even though the poodle snoozing under the table can tell it’s ruff at best. Not a poet? Then why not pop into your nearest gallery of visual art, and treat yourself to a visual artist’s preposterous artist’s statement, and then gaze, deeply moved, at a brace of planks hung from the ceiling with string. It is perfectly possible, however, to be serious about your work, without being a disciple of Onan. The best writers and artists I have met are no-nonsense. Although personally quite capable of being a pompous windbag, I default to self-sabotage instead. I make light of my own work. While telling myself I am doing this not to appear a being pompous bore, it is actually a defence mechanism. It’s the same reason a fat kid in the classroom turns to comedy, to get their self-harming jokes in first. The big problem with making light of your own work is that it gives everyone else permission not to take it seriously either. When I mention I write poetry, people react as if I’d told them I enjoy exposing myself in the local park. It’s as if by this admission I have confirmed people’s worst suspicions. But the fact is that by being self-deprecating you are pandering to those people who would never have any interest or feeling for your work in the first place. Instead it makes more sense to think about people who might actually enjoy it. And doing your work whole-heartedly and unapologetically is far more enjoyable for the people for your audience. After all. These are the people who are important. Being ironic about yourself and your work is a turn off in the long run. 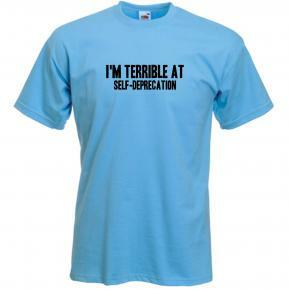 Self-deprecation is self-defeating. It’s just self-sabotage by another name. Coming soon #2 The ‘deliberate’ mistake. This entry was posted in Self-sabotage and tagged self-deprecation, self-sabotage. Bookmark the permalink.